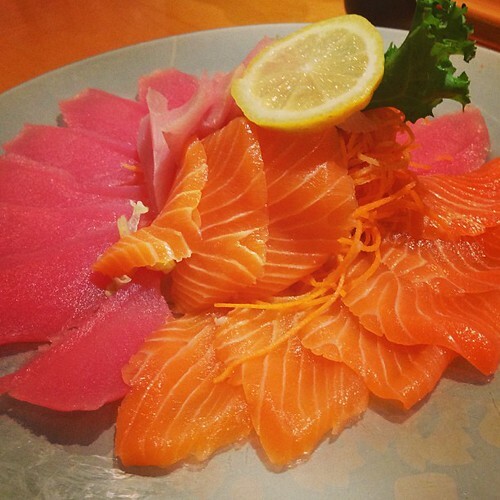 The original Boca Raton location of Bluefin was opened by Japanese-born Chef Yozo Natsui in 2005 and has since remained one of the hottest restaurants for business lunches as well as for evening dining for its excellent and beautifully presented sushi and Thai dishes as well as its modern and attractive decor. Natsui-san, who is a classically-trained sushi chef and has been in the business for over 30 years and is considered one of the prime innovators of American-style sushi, opened up a smaller location in Parkland in 2008, where he leads a staff of hand-picked sushi chefs that he has educated in the art and measure up to his meticulous standards. 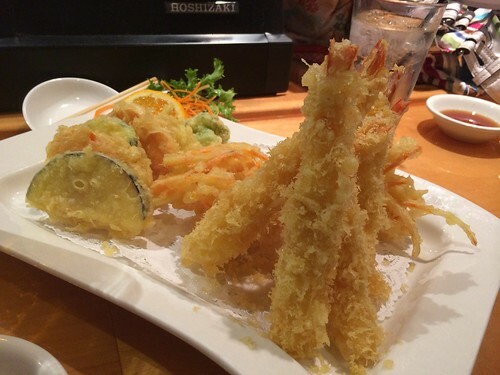 While he continues to consult at the Boca location, he makes the Parkland one his permanent sushi dojo. 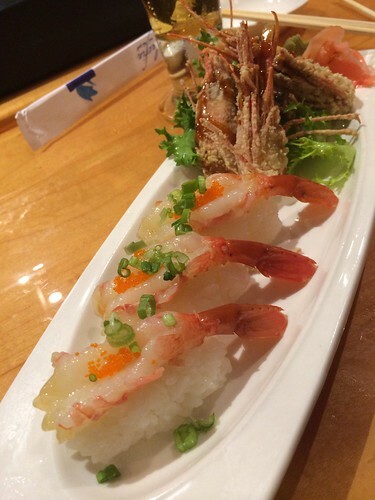 The Parkland restaurant has ample table seating, but if you truly wish to appreciate Yozo-san and his chefs engaged in their art form, you want to sit at the sushi bar and observe their mastery. 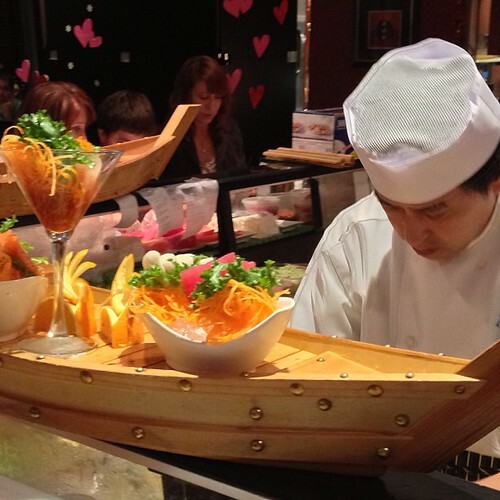 An elaborate sushi boat presentation, with nigiri sushi, makizushi and sashimi in the classical style. 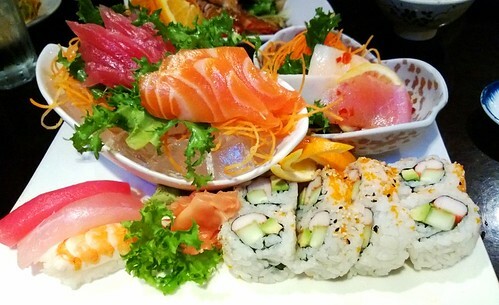 A sushi/sashimi dinner combo, from one of the pre-set menu items. 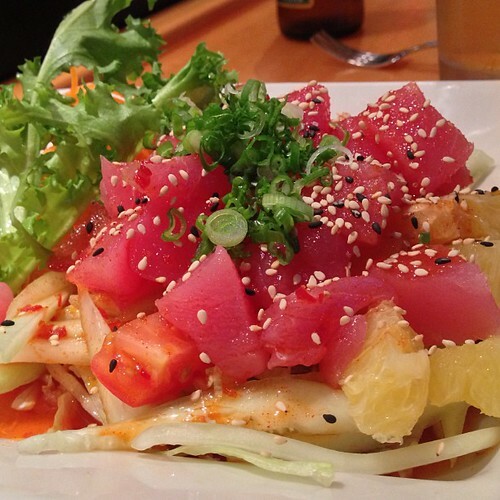 While Yozo-san’s traditional preparations are top-notch, the restaurant prides itself on its unusual and creative preparations. 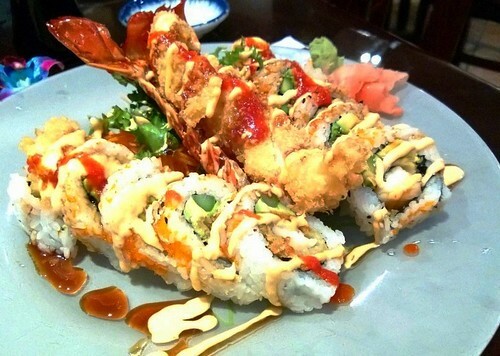 This is a lobster roll, which is an entire deep-fried lobster tail with the meat removed and formed into a makizushi roll, with a sweet shoyu sauce and Japanese-style spicy mayo drizzled onto it. 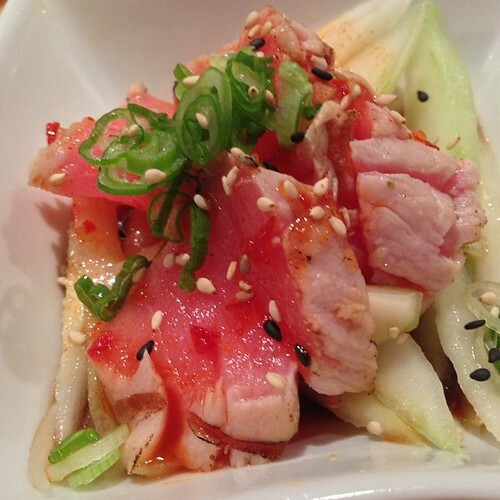 Chutoro, medium-fatty bluefin tuna sashimi in a creative preparation. 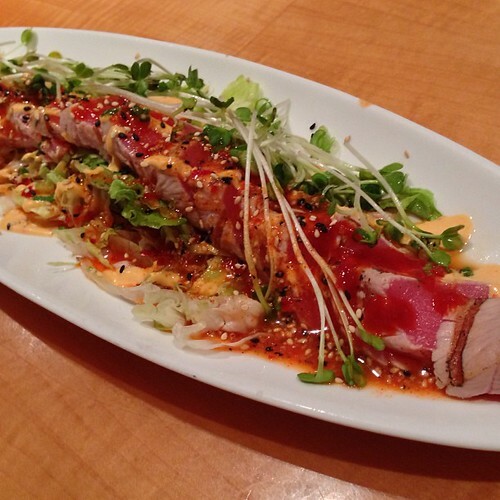 Chutoro, served as a complimentary appetizer at the sushi bar with a Thai-style sweet and spicy vinegar sauce. 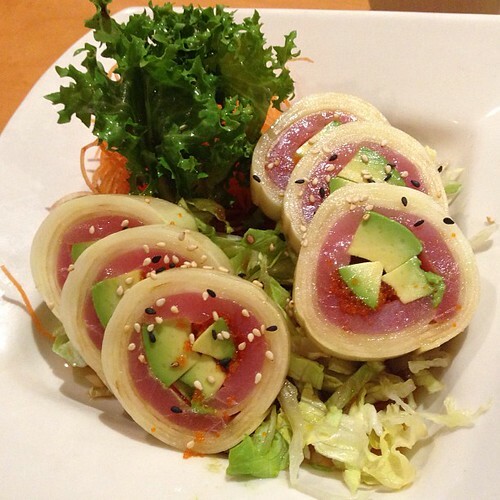 The “Sushi Bomb” which is one of the rolls that made this restaurant famous. 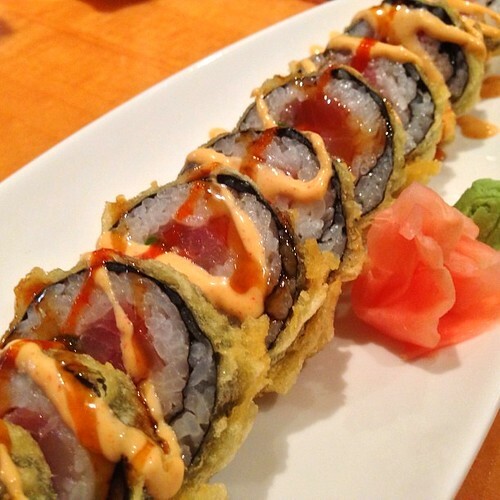 A makizushi of tuna, salmon, escolar, avocado, asparagus, scallion that is fried in a tempura batter and garnished with sweet shoyu-based “eel sauce” and spicy mayo. 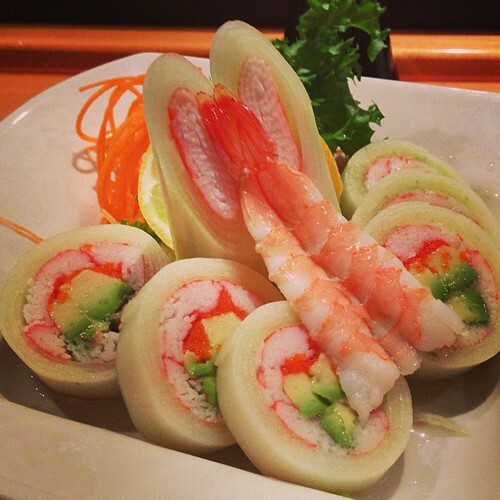 Normally this goes for $13 but on Tuesday nights the place gets packed with people because it’s on special for $5. 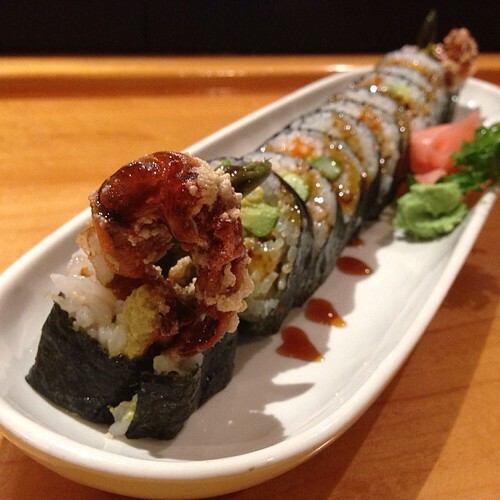 The “Parkland Roll” which is also $13 is $5 on Monday nights. 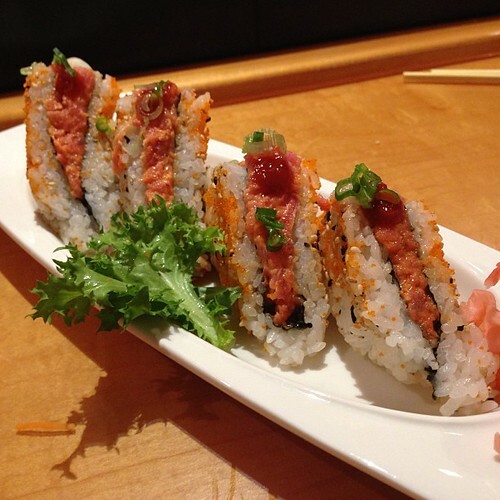 Kani Su, one of the cucumber-based makis. 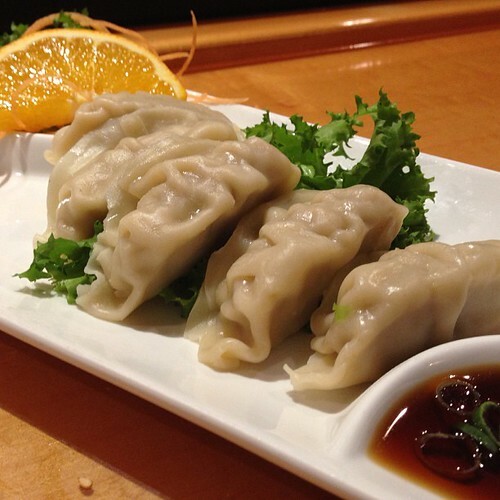 This is seasoned with the sweetened rice vinegar or “Su” that is used to flavor sushi rice. 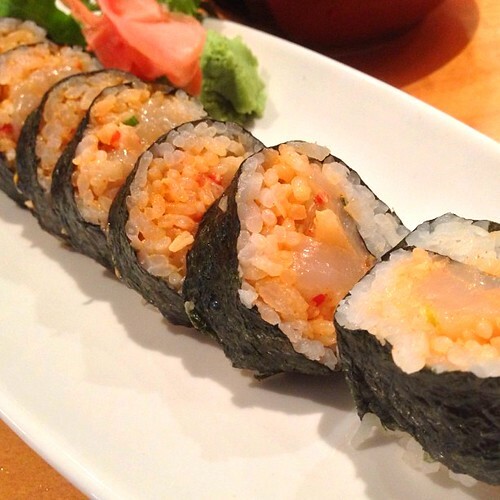 “Hot Tuna Sandwich Roll” in the pressed oshizushi style. 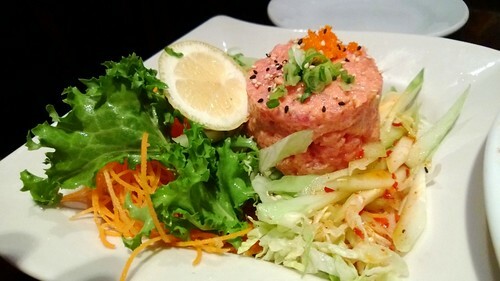 While the restaurant’s primary focus is sushi and other Japanese dishes it also has some very nice Thai items as well. 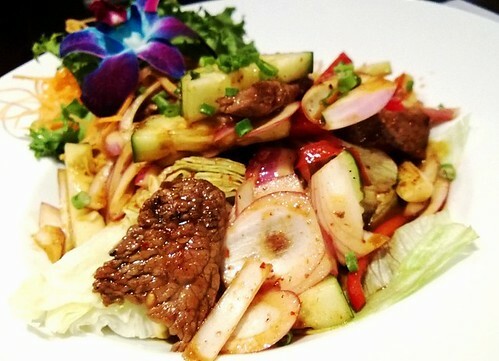 This is a spicy Thai beef salad. 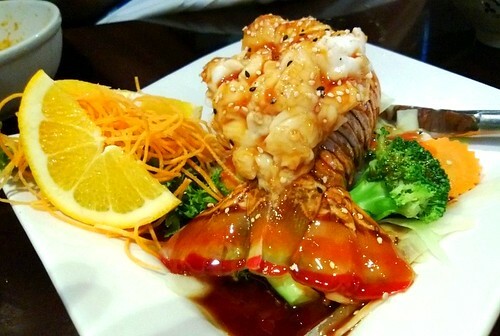 Lobster tail, in a Japanese teriyaki style. 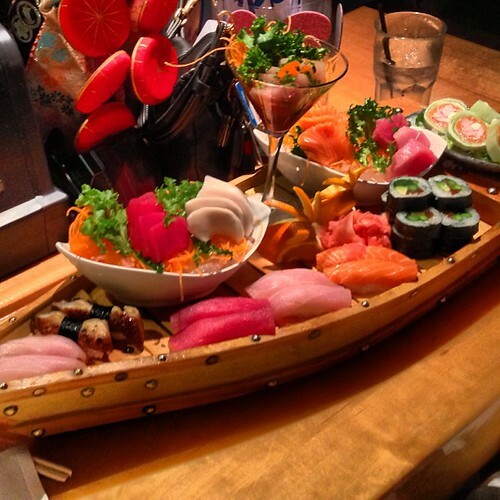 This entry was posted on Saturday, October 19th, 2013 at 2:01 pm and is filed under Broward County, Florida, Food, Palm Beach County. You can follow any responses to this entry through the RSS 2.0 feed. You can leave a response, or trackback from your own site.